BMW executives this week outlined plans to roll out at least 12 electric vehicles by 2025. BMW aims to cut roughly $2.4 billion (2 billion euros) from its annual purchasing bill by squeezing costs for transmission components and other parts to help finance the shift to electric vehicles. Amid plans to roll out at least 12 electric cars by 2025, BMW is seeking to trim about 5 percent from spending on car parts alone, which is currently about 40 billion euros yearly, Markus Duesmann, head of purchasing, said. That compares with a cumulative 4 billion-euro reduction that competitor Daimler AG is seeking in fixed costs, research and development spending and capital expenditures. 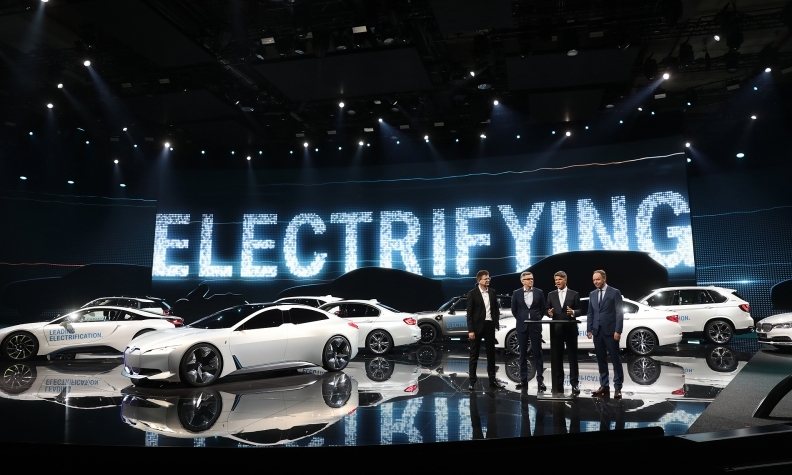 BMW, Mercedes-Benz owner Daimler and Volkswagen are projecting that EVs could comprise more than a quarter of their sales by the middle of next decade. The German companies are pushing for cost cuts to offset weaker margins on electric vehicles, which Daimler estimates could amount to half the profitability of conventional models. "The change in the industry that looms large is significant, it's coming and there's no longer the question of when -- it's now," Duesmann said in the interview at the Frankfurt auto show. "The number of balls we have to keep in the air is huge." The strategy at BMW includes reducing the range of custom options and boosting competition among component producers, Duesmann said. The manufacturer is set to rely less on buying parts from a single company and will work to cut the number of suppliers that have a monopoly position, he said. The savings on conventional auto components are especially critical as overall procurement spending is set to rise by 2 billion euros to 3 billion euros by 2025 amid expenditures on electric cars, including new tooling, Duesmann said. BMW is also responding to the expected pressure on profitability by expanding its offering of lucrative high-end models such as the 8-series coupe and X7 SUV. "We are trying to compensate for the higher investments the company is facing," Duesmann said.